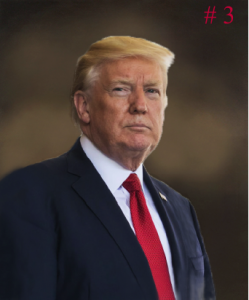 A committee at the Colorado legislature has approved a Trump photo and an associated sketch, which will serve as the basis for a Trump portrait that will be ready to hang in the Colorado Capitol by April. 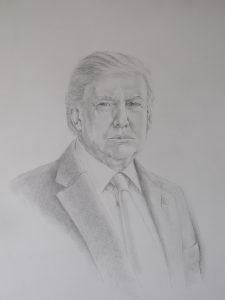 Colorado Springs artist Sarah Boardman offered members of the Capitol Building Advisory Committee (CBAC) two Trump sketches and four photos, showing the president with different expressions and stylistic features, according to materials provided to committee staff by Boardman. 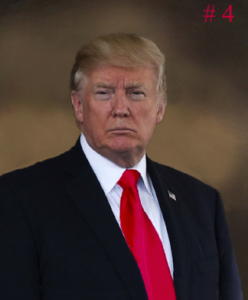 The artist’s preferred photo, which she described as “consistent” with other presidential portraits in the Capitol, shows Trump with a “serious, non-confrontational, thoughtful” expression. 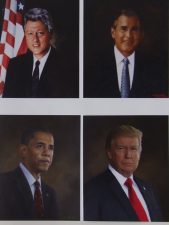 The artist explained her choice of Trump’s plain red tie as “consistently his choice,” and it “also denotes the Republican Party and is the color of strength.” The red tie also has an “artistic purpose,” partly because it “complements and balances” the four presidential portraits in the area. Boardman’s preferred sketch was supported by nine members the Capitol Building Advisory Committee, which has 12 members, including Republican State Senate President Kevin Grantham and Democratic State Rep. Susan Lontine of Denver. Three members of the committee didn’t express an opinion on the sketch. The committee selected the most appealing of the artist’s options, instead of any of the less flattering portrait possibilities. The April completion date for the portrait is months later than the previously announced completion date, which was hoped to be sometime before the Jan. 4 start of the legislative session. But the delay was not an intentional response to Trump’s escalating controversies. Artist’s last-place choice for Trump portrait. 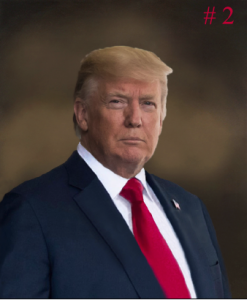 Presidential portraits are excluded from the detailed procedures, but it appears that the Capitol Building Advisory Committee could hold a final vote on whether to accept the final Trump portrait, if it wanted to. Such a vote doesn’t appear to be mandatory and, as a result, would likely have to be requested by the committee chair. It’s not known who will be the chair in April, when the portrait is ready. No committee meetings are scheduled at this time. It’s also not known what would happen if the portrait selection committee switched course and rejected the portrait. But a vote by state lawmakers on the Capitol Development Committee and, possibly, the entire General Assembly, seem possible, given procedures required for art. Artist’s sketch of Trump portrait. Of the twelve members of the Capitol Building Advisory Committee, three are appointed by the governor (whose terms expire in July) and three by both the state senate president and the state house speaker (whose terms expire in January). The two remaining members are the president of History Colorado and the director of the Department of Personnel and Administration. Grantham spearheaded a GoFundMe fundraising effort to create the Trump likeness, saying at the time that Trump is a “populist,” and all citizens should have the opportunity to donate. About $10,000 was raised from 216 donors. 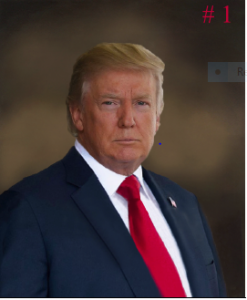 Trump’s proposed portrait compared to current ones at the Capitol. Boardman, who’s working on the art, also painted portraits of Barack Obama and George W. Bush for the third-floor Capitol rotunda, where portraits of U.S. presidents adorn the walls. The overall goal of art and memorials at the Colorado Capitol is reflect the the “enduring cultural and historical values the Capitol and its grounds represent to the citizenry of Colorado,” according to the written guidelines of the State Capitol Advisory Committee. I have to admit, the artist didn't have much to work with — what with *rump's beady-eyed stare and generally dyspeptic disposition. Who is that and what did they do with the real Donald Trump? FAKE PICTURE! I see a sneer with an edge of meanness. As in F-U liberals. The day that Drumpf ever looks “thoughtful” is the same day I’ll eat a bucket of Voyager’s shorts . . . I'm just sorry the artist didn't see fit to honor the subject by switching perspectives from portrait to landscape, and allowing Trump to truly fill the frame. His portrait should be a still of him cowering next to that eagle. The most appropriate picture would be one of Trump kissing Putin's rear end.